Sausage casings for making snack sticks, breakfast sausage, bratwurst, kielbasa, italian and summer sausage. We carry DeWied natural hog casings, collagen casings and fibrous casings. Natural sausage casing can be packed in a salt brine solution or even dry salt such as in the Home Pack Sausage Casings. 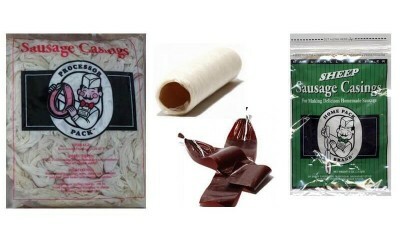 Collagen casings are made of beef protein and provide ease of use for the home sausage maker. These DeWied hog casings are natural and packed in salt water. They are 35-38mm in size and are perfect for Polish Sausage, Kielbasa, Smoked Sausage, Boudin, or Italian Sausage. Bag contains 1 hank and will pack approximately 100 lbs of meat. Made by DeWied. Usage: Rinse with fresh water; then, soak..
Packaged for the home sausage maker in mind these short strands of DeWied Hog Casings are suitable for home use. Perfect for Bratwurst, Italian Sausage and Kielbasa. Approximately 20 yds. of 32-35mm sausage casings. Made by DeWied. 8 oz. bag for approximately 25 lbs of meat. Usage: Rinse with fresh ..
Packaged for the home sausage maker in mind these short strands of DeWied Sheep Casings are suitable for home use. Perfect for Snack Sticks or Breakfast links. Approximately 20 yds. of 18-22mm sausage casings. Made by DeWied. 5 oz. bag for approximately 15 lbs meat. Usage: Rinse with fresh water; t..
Mahogany Fibrous Sausage Casing - 1 1/2" x 12"
A non-edible mahogany fibrous casing used for small diameter Summer Sausage and Salami. Size: 1 1/2" x 12". 1 piece for approx. 1 lbs meat. Usage: Soak in warm water for 1 hour prior to use.Storage: Keep in dry storage.Don't forget a pair of [product_id=369]Hog Ring Pliers[/product_id] and a box of ..
A non-edible mahogany fibrous casing used for small diameter Summer Sausage and Salami. Size: 1 1/2" x 12". 1 piece for approx. 1 lbs meat. Bundle of 25 casings.Usage: Soak in warm water for 1 hour prior to use.Storage: Keep in dry storage.Don't forget a pair of [product_id=369]Hog Ring Pliers[/prod..
A non-edible mahogany fibrous casing used for small diameter Summer Sausage and Salami. Size: 2 1/2" x 20". 1 piece for approx. 3 lbs meat. Bundle of 25 casings.Usage: Soak in warm water for 1 hour prior to use.Storage: Keep in dry storage.Don't forget a pair of [product_id=369]Hog Ring Pliers[/prod..
A natural sheep casing with size ranging from 22-24 mm which are excellent for Wieners, Frankfurters, Breakfast Sausages and Little Smokies. This is a grade A casing for wiener / frankfurter emulsions. Bag contains 1 hank for approximately 40 - 50 lbs of meat. Made by DeWied. Usage: Rinse with fres..